So far on my journey it’s been a wonderful experience meeting people from each winery and discovering their similar but also different philosophies. Peoples’ philosophies may relate to the management of their vineyards, such as whether they use sustainable practices, are organic or biodynamic. 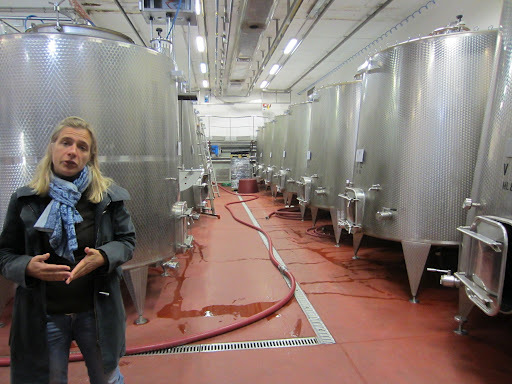 In the winery they may change how they use equipment and additives, what their maturation program is, and how they have designed the layout of their facility. Wineries have different approaches to how they brand and communicate their wines, and also how they welcome visitors to their wineries. The thing to remember is that no one philosophy is the best or right one, as every country, region, producer and audience/market is different. 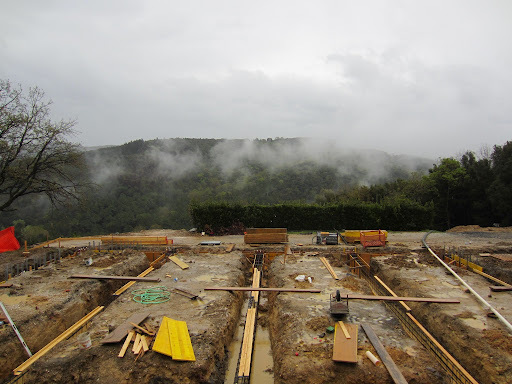 What is most important is to select the right approach for that winery and place, and this is how I have determined to assess whether the philosophy has been successful. Within the space of one day I visited four wineries that had similar but different philosophies, but were all successful in themselves and offer something different. Between the first and last winery I had covered a fair amount of ground, leaving very early and finishing late. Like many wineries in Italy, particularly in Tuscany, the history of Brancaia has been quite recent. After falling in love with Tuscany on a trip from Switzerland, the Widmer family were afforded the opportunity to purchase land in the Chianti Classico DOCG region in the early ‘80s. With backgrounds in advertising, the Widmers had no experience and particular interest in wine production, but their daughter Barbara did. After relocating permanently to Tuscany, she took over the running of the original estate and began to grow the business. In the preceding years she made such intelligent moves as converting the viticulture to organic and sustainable practices, purchasing a second estate of a similar size in another part of Chianti Classico, and converting the farmhouse/cellars to a modern and functional winery (at some expense and difficulty). Within the two vineyards here model is to achieve the level of quality necessary for the top wine with all fruit, regardless of which wine the fruit may end up in. 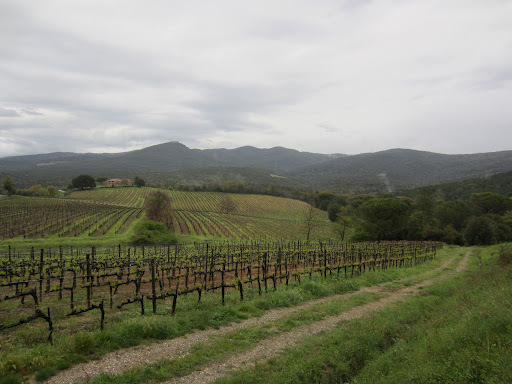 More recently a third vineyard has been established in the rapidly emerging Maremma region in the south-western part of Tuscany with the same principles applied to a different microclimate and soil composition. Careful selection identifies the best parcels each vintage, which end up in the two most important wines, with a large proportion of sangiovese going towards the Chianti Classico. Anything that is deemed to be not up to grade for these wines goes into the Tre, named as such for the three vineyards, three varieties and was originally the third wine. Barbara told me that if it were not for this wine, she would be forced to sell wine in bulk which she would not make any money from, but now can provide excellent quality wine at a great price. Her influence over the cellars is quite noticeable, and when you see the colour schemes in the cellars you can’t help but think of the modern and bold labels she uses in different colours across the entire range. With limited time I settled for a tour of the cellars, but I was able to meet with Barbara briefly at Vinitaly and taste most of the wines. Click here to read my notes. Modern Tuscan wine, particularly Chianti, owes a lot to the pioneering hard work of Paolo De Marchi. His family hails from Turin, and made their living in finance. They were not agriculturalists at heart, and did very little to land they already owned in northern Piedmont. 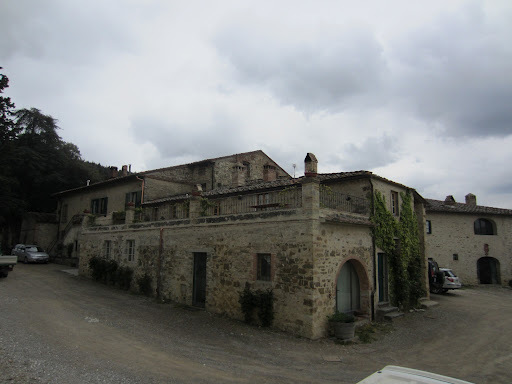 In the 1950s the family acquired the Tuscan estate of Isole e Olena, belonging to one of their clients, but similarly had very little interest in developing this estate either. Unlike his four siblings, Paolo had a great love of the land, and begged his family to allow him to explore opportunities on the estate, and thus he relocated to the sunnier region to the south. With some experience working summers on the family estate in Piedmont but very little money he began the slow but deliberate development of the estate. It was his philosophy that red wines should be made from red grapes, and feeling that the best grape for the region was sangiovese, began to produce the Cepparello wine from 100% sangiovese. Like the Antinori Tignanello wine, this meant stepping away from the regulations which stated that the use of white grapes was mandatory, and similarly was classified as a table wine. Through his perseverance he established a reputation for this quality wine, and thank goodness as we could still be drinking Chianti made from a blend of red and white grapes. Paolo and his Uruguayan wife Marta are constantly looking at how they can improve the estate from which they source all of their fruit, but feel that the cellars completed many years ago to accommodate modest growth are ideal for producing their style of wine are perfect. Above ground the 18th and 19th century buildings perfectly suited the environment, but underground the ample cellars house wine in barrels and bottles maturing very slowly. Isole e Olena wines are available all over the world, and in all senses represent wines of personality, authenticity and value. Marta and I shared a fantastic tour and discussion of each others backgrounds, before sitting down to a tasting of the range. Click here to read the notes. Bolgheri can be found about two hours away from Chianti on the coast, and is home to some of the most sought after wines in the country. Many years ago the entire area was a swampland, proof of which can be found in many of the towns up to 100 km inland being named ‘Maritimma’. After the swamp was drained the coast was used for various types of agriculture and grazing, as it had very fertile soils and plenty of rainfall. The Antinori owned vineyards in the region in the first half of the 20th century, but produced rose wines from the fruit. 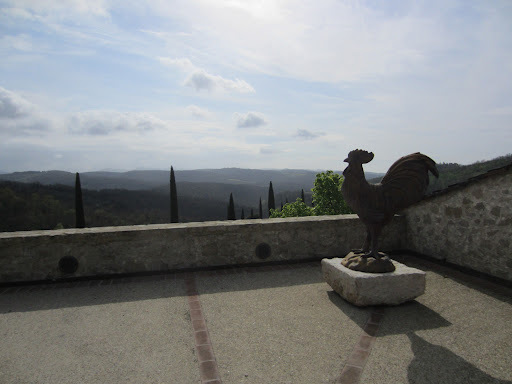 This all changed with the establishment of the Tenuta San Guido vineyards off the coast in the hills, and the production of the first wines in Italy made with cabernet sauvignon back in the 1930s. As it was illegal to sell wine made from non-Italian grape varieties at the time, the wine was enjoyed by the family, who were naturally great lovers of Bordeaux and its wines. Eventually the wines began to be sold, and very slowly a modern icon was established, with others to follow. Lovers of Italian wine would be familiar with such names as Sassicaia, Ornelaia, and Masseto, and it is hard to ignore the quality of the red wines from this relatively small viticultural area, in spite of them being made predominantly with non-Italian varieties. The expansion and development of the region is now very tightly controlled, which is very prudent in the global economic environment, and any new vineyards must be approved by the local consorzio. It was here that my final appointments for the day were, and their history and futures are intertwined. Back in the late ‘70s, before the acclaim and attention of ‘super tuscan’ wines had arrived, Piermario Meletti Cavallari developed the Grattamacco estate in Lungagnano for viticulture. When the fruits of his labours were finally released in the 1982 vintage, the winery gained immediate success. The combination of the varieties in the soils comprised of a mixture of calcareous sandstone, clay, flysch and marl, the gentle aspect of the plantings and the site selection of the varieties, showed the increasing potential for full yet structured and elegant red wines. Fast-forward to 25 years later, and Piermario was approaching retirement, and decided to lease and eventually sell the vineyards and winery to Claudio Tipa. Claudio had recently established the Collemassari winery in nearby Montecucco with the support of his family, who had made money in the pharmaceutical industry. It was his commitment and passion that convinced Piermario that the estate was in good hands and the only thing that has changed is the long overdue building of a new winery. The estate since the purchase has been under the careful and respectful eye of Luca Marrone, whose dream came true when he received the opportunity having been a huge fan of the wine already. Luca’s philosophy is to intervene with nature as little as possible, merely observing carefully the environment and vineyard and only doing what is necessary to protect and strengthen the vines. This philosophy carries into the winery, with parcels treated separately throughout the vinification, using natural fermentations and limited oak manipulation. The character and intensity of the wine comes from the variety and site, and to do too much in the winery would interfere with the expression. Like at Brancaia, all parcels are treated equal, and have the potential to go into the top wine. With the prices of other Bolgheri wines rising steadily, Grattamacco remains sensational value for the quality. Click here to read the tasting notes. When the Meletti family sold the holdings of Grattamacco, they were well compensated, and understandably so. His son Giorgio took the opportunity to establish his own estate to not only produce wine but also an agriturismo which is where I spent the night as his guest. With studies in Siena and experience in regions such as Franciacorta, Chianti and California Giorgio at a young age established his own vineyards in organic principles as his father had done at Grattamacco, planting cabernet sauvignon, syrah, merlot, viognier, vermentino and cabernet franc. From the 12 hectares he owns he is producing a range of white, rose and red wines, some of which he exports and most of which is sold in Italy. As the estate is still quite new, he freely concedes that there is much more to be learned and developed, but there is great potential. Click here to read my notes. Click here to see more photos from Day Three in Tuscany, Italy.